In the last few weekends, NROI has run 2 IPSC Licence Courses. One in Copenhagen and one in Dall. Both were very successful and now we have 19 more Danish shooters with IPSC A license. I hope to see you out on the range. Danish Range Officers don't just work at competitions, they also work on IPSC Licence Courses and Range Officer courses. Included are some pictures from the license course in Copenhagen, but NROI wish to thanks all NROI Instructors for their time and continued commitment. Weekenden d. 30 November. og 1. December kl. 8:00 - 16:00 begge dage afholdes et kursus på Københavns Skytte Center. Sidste frist for tilmelding er d. 17. November! 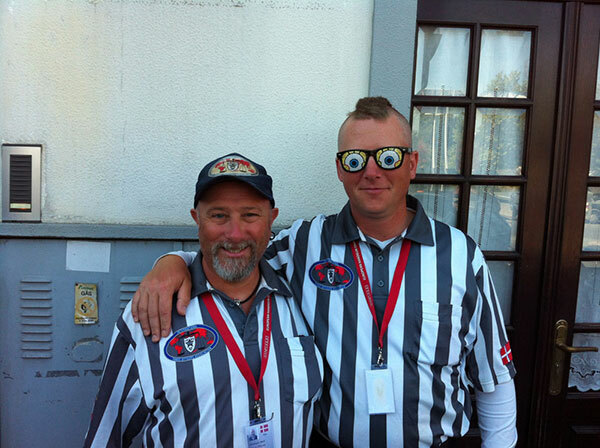 Mark Weisinger and Ulrik Saxhøj in Portugal, waiting for a bus to go to the range for the European Handgun Championship 2013. As you can see we were waiting a long time. Ulrik and myself both had the pleasure to work at European Handgun Championship 2013, where we were 22 Danes shooting the match. Danmark har fået en ny IROA CRO. Stort tillykke til Mark S. Weisinger i anledning af hans udnævnelse til IROA CRO. RO Udvalget har besluttet, at avancere Mark Weisinger til NROI Range Master. NROI ønsker tillykke med udnævnelsen.